When the credits die away, for the first time in the whole season the Skye Boat melody does not extend into the title sequence. This is a symbol in itself. All anticipation is gone. We have reached the endgame. 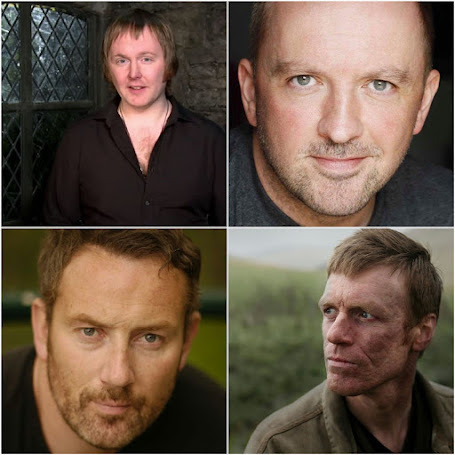 The Battle of Culloden and the end of season 2 are upon us - and no one is happy. Instead of a musical refrain, there is a television screen. An episode of the 1960s television show, “The Avengers” is playing, complete with its strong female character, Emma Peel, who is dressed in leather catsuit and fencing mask and lunging towards an imaginary opponent, sword in hand. Whether the swordplay is deliberately hinting at future events in the episode is unclear, but it is obvious that for now at least, we are back in the 20th century. 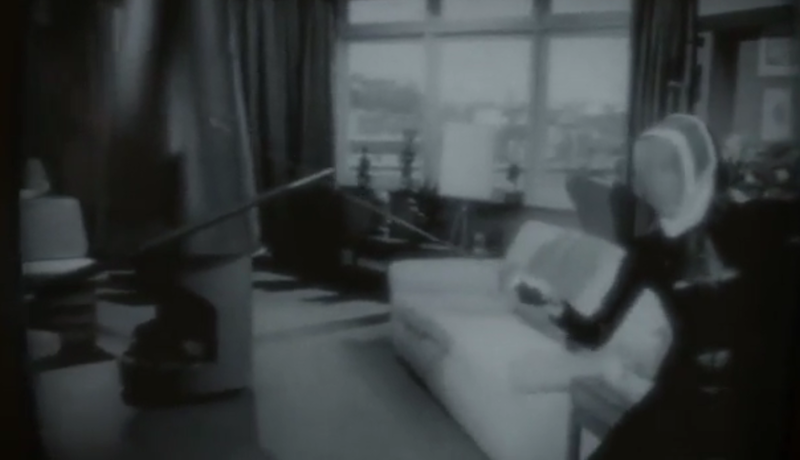 The camera pans out and a date flashes onto the screen: Scotland 1968. A group of children are sitting around the black and white tv, transfixed by the images on the screen. In the middle of them all stands a solemn, bearded man. He is looking at the screen too, but it appears as if his mind is elsewhere. A young woman enters the room and gently reminds him that it is time to get back to the guests who have been asking for him. After an uncomfortable bit of shuffling, he does so. It is clear from his face that he has been hiding in this study, but the time is up. 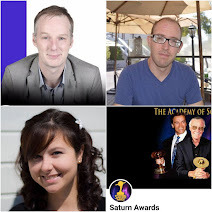 From the earliest moments of the episode, we understand that dealing with loss and the need to find the strength to do the emotionally impossible are going to be recurring themes. Soon enough, we understand the reason for the reluctance. The serious young man is none other than Roger Wakefield, last seen as the cherubic biscuit-loving tyke of 1948. A man grown, he is now hosting a wake and carrying out the wishes of his late father, the Reverend Wakefield, by making a toast to death. 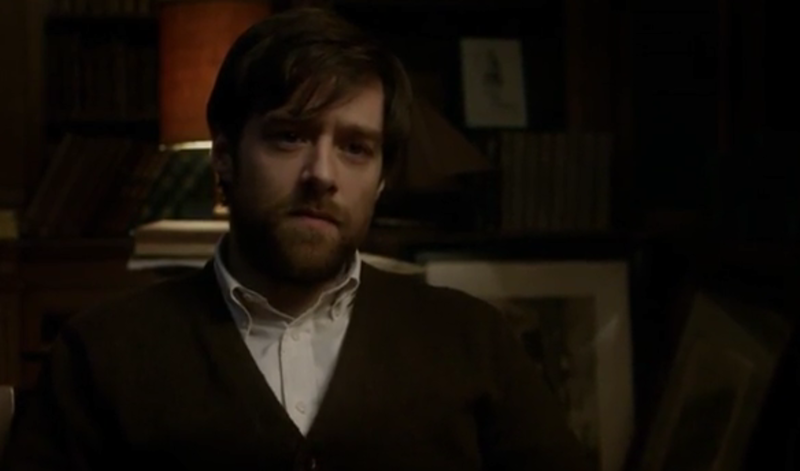 Slowly, the mourners are revealed, including Claire, who stands contemplatively in the background, a whisky in hand. Obviously older, she is poised, her hair sleekly styled with grey tinges around her temples. She too, looks unhappy. The formalities over, Roger is mingling with his guests and accepting condolences, when a tall, red headed young woman catches his eye. It takes some time before he can extract himself from his well wishers to make introductions. Despite his grief, he is clearly interested on finding out who the mystery woman is. Their conversation has barely begun however, when Claire joins the pair, calling Roger by name. Quickly some main details are established: Roger wouldn’t remember Claire because the last time he saw her he was only 7 or 8, the Reverend has passed away suddenly from a heart attack, the red haired young woman is Claire’s daughter, Brianna, Claire is now a surgeon, Brianna is a history major, they live in the States and Frank is dead. This is all information known to book readers, but hearing Claire introduce herself as Randall, not Fraser, is still jarring, as is the mention of Frank as her husband, and not Jamie. For tv only viewers, it now becomes clearer why the first half of episode 1 took place in 1948 - at least a bit of groundwork was laid to make the opening moments of this finale less of a shock. Nevertheless, it is still a lot to take in! Claire asks after Mrs Graham, only to be told that the older woman has also passed away and that Mrs Graham’s granddaughter, Fiona, has since taken over the employ. Wistfully, Claire remarks that while so many things are the same, so many more are different and she excuses herself to take a look around. Left alone, Roger and Brianna continue their awkward conversation, only to be interrupted again, this time by the appearance of the aforementioned Fiona Graham. 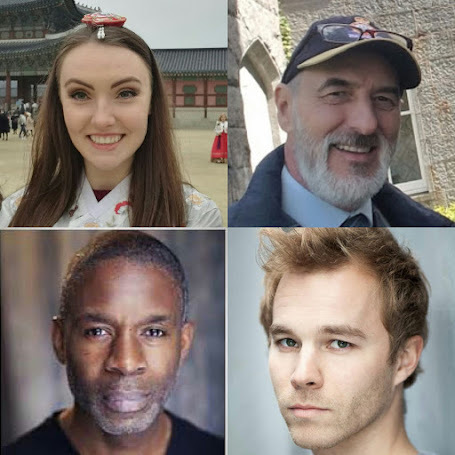 In her short time on screen, (that only book readers will properly appreciate) actress Iona Claire gives a perfect portrayal of the motivations of this relatively minor character. She also sees it as an opportunity to see the sights, flirtatiously requoting an earlier remark of Roger’s that Scotland is “beautiful, wild country.” She meets his eyes full on and he is impressed. This is intuitive acting on the part of newcomers Richard Rankin and Sophie Skelton. In these early scenes, they are already laying the foundations, beginning to establish the character traits of two much loved characters. It is as if this admission opens a door for Roger, who begs leave to ask Claire a personal question. With the grief for his father showing fresh on his face, Roger asks Claire how she managed to do it: to say farewell to the person that she loved most in the world. 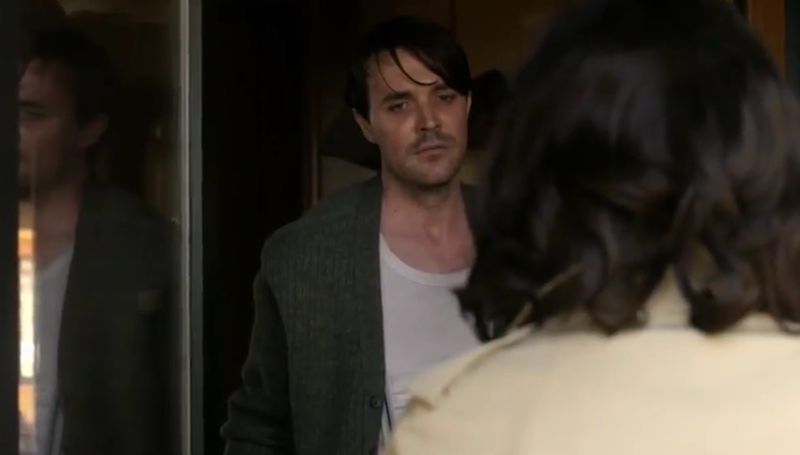 He is of course speaking of Frank, but viewers know who is really on Claire’s mind. 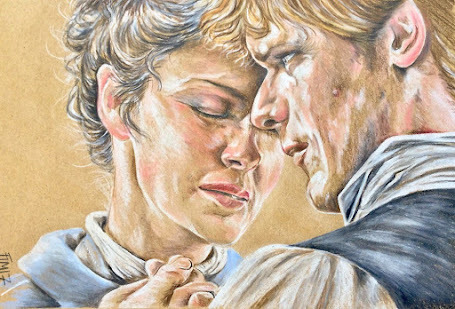 Raising her eyebrows, Claire admits that she has never been very good at saying goodbye, adding that the hell of it is that the person has gone and that there is no choice but to go on living without them, because that’s what they would have wanted. Roger is becoming tearful, but Claire is dry eyed. This is a strangely composed Claire, and her speech is all the more troubling because of it. The body of Claire has indeed gone on living, but it is all too clear that her spirit has not. Draining her glass and thanking him for the whisky, Claire bids Roger good night and leaves him sitting by the fire. Back in the guest room, Claire gazes at a sleeping Brianna, marvelling aloud at how like Jamie her daughter is. At this point, Brianna’s sleeping silhouette fades, to be replaced by Jamie. We are back in the 18th century. It is 7:23am on the morning of the 16th April, 1746. 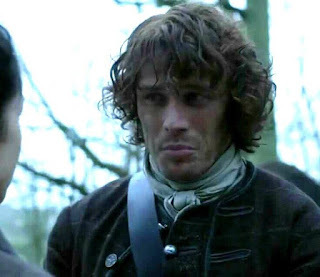 A gaunt, muddy Jamie is walking with Charles Stuart, making a last ditch effort to convince the Prince that the men are in no condition to fight. But Charles is not listening. Gone is his previous high regard for Jamie and with it, any chance that he will listen to the highlander’s reasoning. Instead, a rather impatient Prince brands Jamie his “Thomas”, likening him to the disciple Thomas who would not believe in Christ’s resurrection until he saw the nail marks in Jesus’ palms for himself. 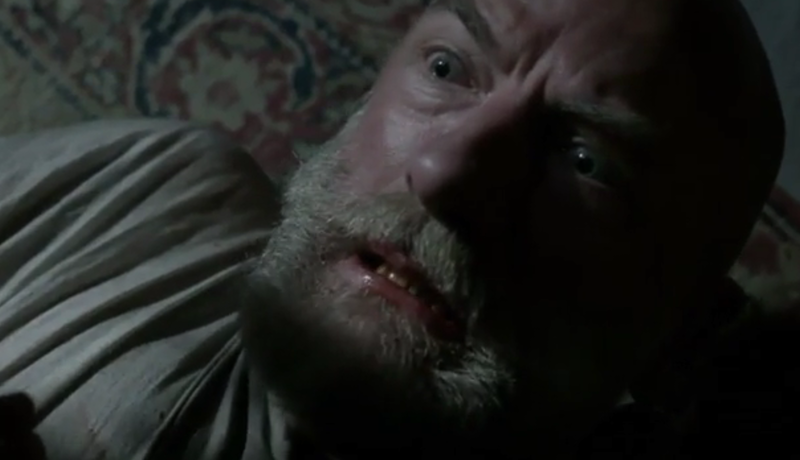 Charles stalks away, saying that he will make a believer of Jamie by the end of the day, but the battle will go ahead. 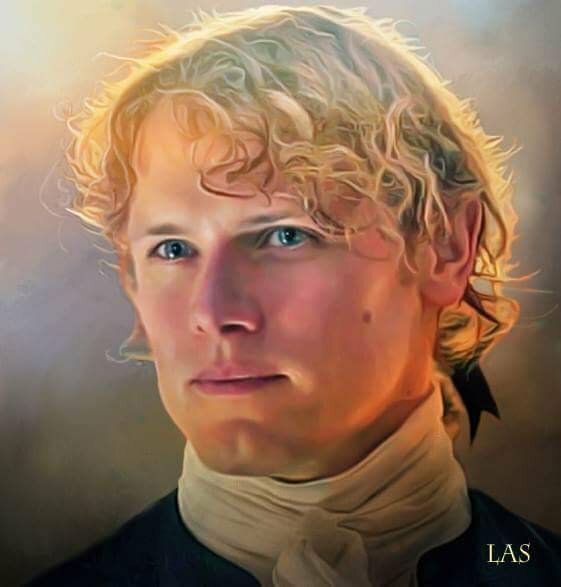 Angry, Jamie seeks out Claire, commenting that it is a blessing that Colum didn’t live to see this dark day and that the battle will happen, just as history had foretold. Murtagh joins the couple, reporting on the latest progress of Cumberland’s army, who have already begun their march. 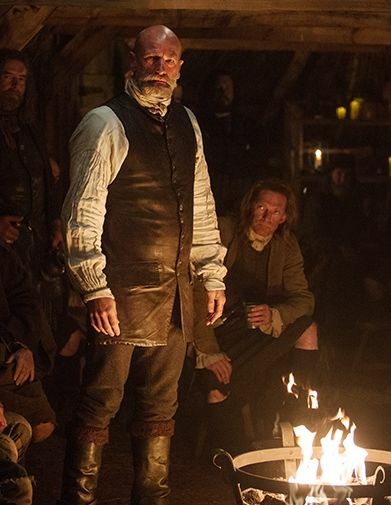 Jamie sends Murtagh to inform Lord Murray, as Claire murmurs that there is only one thing left, one possibility. It is not something to be discussed out in the open however, and she leads Jamie inside the house. Time jumps again, and Roger and Brianna are in a car checking out the sights of Scotland. It is reminiscent of the trip that Frank and Claire took in the very first episode of season 1. The two are relaxed, laughing, as Roger acts as historian and explains the significance of the local sites, much in the same way that Frank had done. 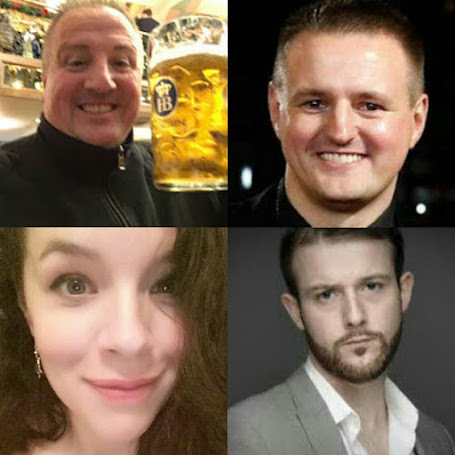 But while Frank and Claire were at Castle Leoch, Roger and Brianna are at Fort William, trading stories and laughing at Brianna’s bad Scottish accent, intermingled with Roger sharing the grisly history of the place. Brianna asks Roger for details about Frank and he responds with his memories of Frank’s fashion sense and his kindness. 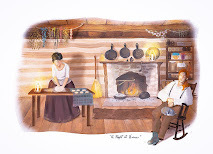 Brianna agrees, branding Frank the “kindest man in the world.” When Roger adds that he also sees Claire’s kindness, Brianna responds by saying that her mother lives in another world. It is the frustrated utterance of a young woman who has a difficult relationship with her mother, but it is a comment with a poignantly true edge. 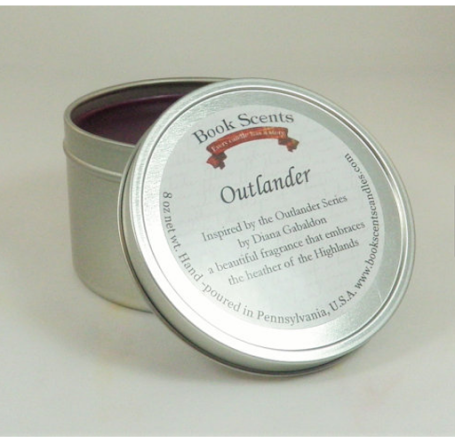 Claire’s thoughts are indeed in another world, with Brianna’s every word and action unwittingly reminding her of its loss. Pulling her coat around herself, Brianna remarks that the place gives her the chills. 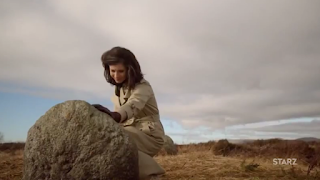 For viewers, this is hardly surprising, knowing that she is looking up at the spot where her biological father was flogged and her paternal grandfather died from the shock of seeing it happen, at the hands of yet another distant ancestral relation, Black Jack Randall. Meanwhile, Claire has driven to another place full of memories, the now dilapidated Lallybroch. 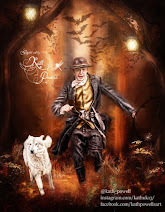 Surrounded by the ghostly voices of Jamie, Jenny, young Rabbie and her younger self, Claire’s eyes fill with tears to see the ‘Keep Out’ sign and the condition of the place that was once home to her. Sitting on the steps, Claire looks towards the entrance and imagines the figure of Jamie gazing back at her, as in her mind they both recite the love poem: “Come and let us live, my dear; Let us love and never fear; And let amorous kisses dwell; On our lips begin and tell; A thousand and a hundred score; A hundred and a thousand more.“ Brushing her fingers over her lips, Claire closes her eyes as Jamie’s apparition disappears, leaving her alone in the courtyard. Wiping away her tears, she stands and moments later we see her driving away. Time shifts centuries once more - 7:36am on the morning of the battle. Inside Culloden House, Claire hastily explains their final possible move: the death of Charles Stuart. Everything about the battle depends on Charles, she says, so if he were to die, the battle wouldn’t happen. Claire shows Jamie the bottle of Yellow Jasmine that she gave to Colum in order to give him a quick and peaceful death. 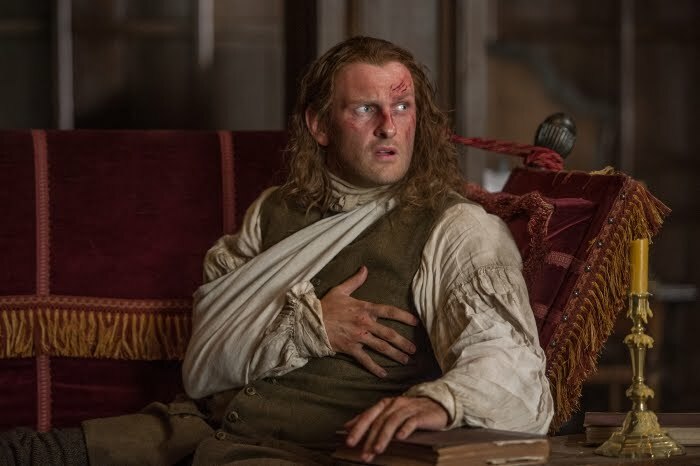 The revelation is a shock to Jamie: in taking his own life, Colum had committed a mortal sin. But Claire carries on: she has been treating Charles for scurvy for weeks and could put the poison into a tea. He would drift off into a deep and permanent sleep and no one would ever know. It is a troubling plan, but their only option and one that Jamie is obviously considering. Back in 1968, Brianna and Roger are enjoying a picnic. 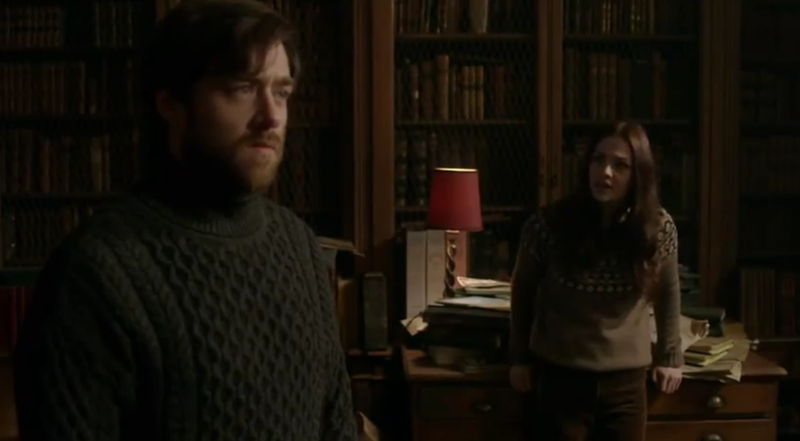 Brianna quizzes Roger about his memory of a big event involving Frank and Claire when they were last in Scotland. Roger explains that he was only a wee lad, but does recall finding Mrs Graham crying over a pile of broken things in the tool shed, things that Frank Randall had apparently smashed while in a temper. Brianna is confused by this, as she remembers her father keeping his temper tightly under wraps. Roger says that he didn’t think that was the reason for Mrs Graham’s tears, although he can’t remember what was, narrowing down the timeline to either 1947 or 1948. Brianna tells her own story of once breaking open a locked box of Frank’s and finding a letter from Reverend Wakefield, hinting at an incident involving both Claire and Frank. Sure that it was something big, Brianna had found the letter scary and had never mentioned it again. Roger recalls that his father used to keep journals and that if Brianna doesn’t mind “getting a big grubby” they could drag them out of the storage room and look at them. After an awkward joke in which Brianna says that grubby doesn’t bother her and that Roger should see her bedroom, she agrees. They finish their picnic and pack the car. Claire has driven into town, where we see the number plate of her car clearly. COO 903B. 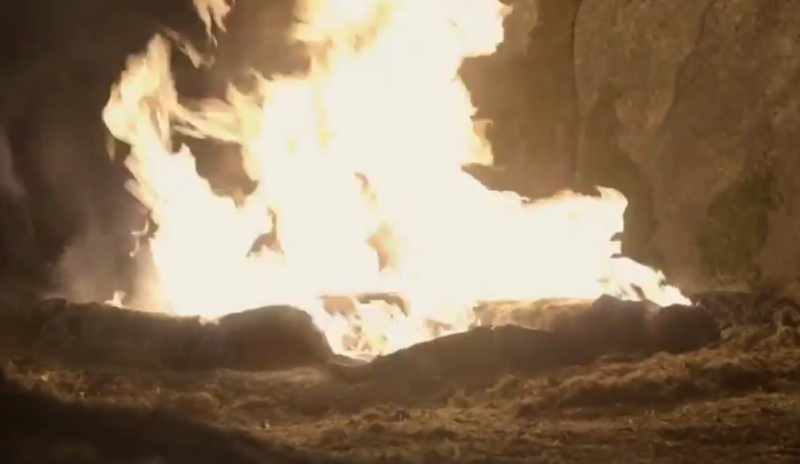 Whether this is a deliberately humorous touch from the designers as a nod to the method of Jamie’s rescue at the end of season 1 has not been mentioned in any official interview, but it certainly provides a moment of amusement for observant viewers! Claire’s mission though, is a serious one: she is seeking the chain of title to Lallybroch. The woman in the genealogical office finds the document easily enough, remarking that it is the earliest one they have in their records. It is a deed of sasine, transferring ownership of the property from James Alexander Malcolm MacKenzie Fraser to James Jacob Fraser Murray. Claire smiles briefly at the sight of Jamie’s handwriting, as the woman continues reading the details of the document, including the names of the two witnesses: Murtagh Fitzgibbons Fraser and Claire Beauchamp Fraser, although the final surname has been smudged somewhat. Claire asks what happened after the property was transferred and is told that the property had stayed in the Murray family for many generations. 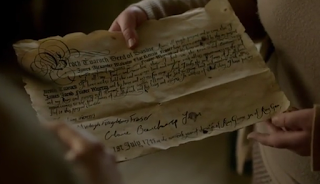 A copy of the deed has been made for Claire and she accepts it gratefully, before asking if a genealogical search can also be done. The woman confirms that it can and asks for the name, which Claire provides: Roger MacKenzie. Her good mood broken, Claire responds distantly to Brianna’s next questions about her own movements for the day, saying that she had just been puttering around the village. Brianna notices the mood change too, asking her mother whether she misses Frank. Claire answers with the obligatory “Of course”, but Brianna is not convinced, adding that sometimes it doesn’t seem as if Claire does, or if she ever loved him at all. Claire is thrown. Instead of answering directly, she deflects, responding to her daughter’s question with “What a thing to say.” But Brianna will not be put off, repeating her question - had Claire loved Frank? “I did,” says Claire, but the answer is far from convincing. The next scene is back in Culloden House, where Jamie and Claire are in earnest discussion. Jamie says that what they are considering is cold blooded murder. “To stop a slaughter,” adds Claire. 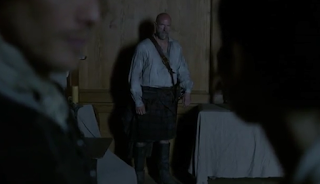 At this point, the viewers are made aware of something that Jamie and Claire are not: a horrified Dougal is listening to this plan from outside the room. Roger and Brianna have arrived on campus, where Roger has a meeting before their great journal excavation can begin. 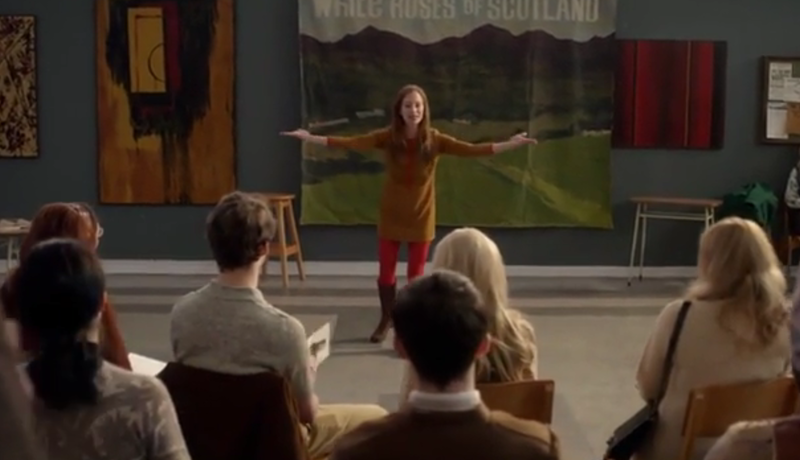 Brianna wanders the building and stumbles across a meeting of the White Roses of Scotland. 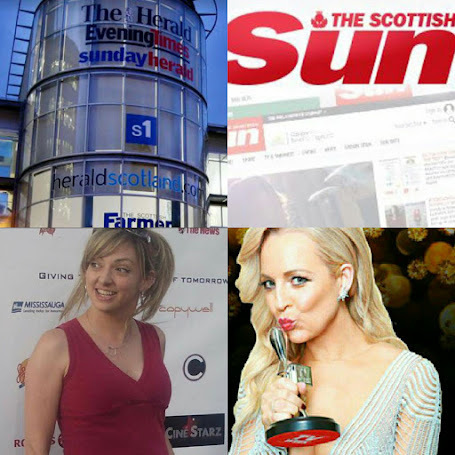 The voice of the presenter, as it passionately decries the loss of the Scottish spirit at the hands of the English, is immediately known to the viewer. Soon, the camera reveals a modern day Geillis Duncan, known in the 20th century as Gillian Edgars. As Brianna watches and listens, Gillian asks the assembled crowd, “Where are the rulers of old, who knew how to look after their people?” She goes on to list 3 great rulers: King Arthur, Richard the Lionheart and Prince Charles Edward Stuart. To both reader and viewer, this third addition is laughable, but Gillian has the crowd in the palm of her hand, asking the crowd to imagine a Scotland that had thrived after a victorious Battle of Culloden. Throwing her arms out wide and with every bit of Dougal MacKenzie’s passionate Jacobite fervour, she proclaims, “I am Bonnie Prince Charlie, You are Bonnie Prince Charlie, We are Bonnie Prince Charlie. Aye! Scotland, Scotland, Scotland!” The crowd joins in the enthusiastic chant, as Brianna watches, impressed. After the lecture, Brianna engages Gillian in conversation and argues points of history. 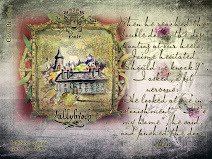 Gillian is intrigued, and given that Brianna is not a student on campus, asks Brianna, “Why are you here?” It is a direct copy of the question that Geillis asks Claire in the 18th century and a clever addition by the writers. Brianna replies that as a history student she enjoys watching history being made. It is another clever line, as Brianna doesn’t know that this is indeed what she has been doing, given that 1968 is the year of Geillis’ own travel through the stones. 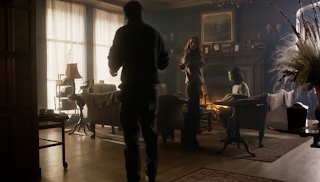 Roger arrives and the conversation is stopped, but not before Gillian gives Brianna a pamphlet for an upcoming rally. Claire is also revisiting history. Wandering through Culloden’s visitor centre and museum, she is met with a wax statue of Charles Stuart. A passerby comments on the Prince’s height, to which Claire replies that he wasn’t that tall in real life. Stuart could have been great, she continues, with the name, the cause and the support of good men willing to lay down their lives for him. Instead, says Claire, history has taken a fool and turned him into a hero. 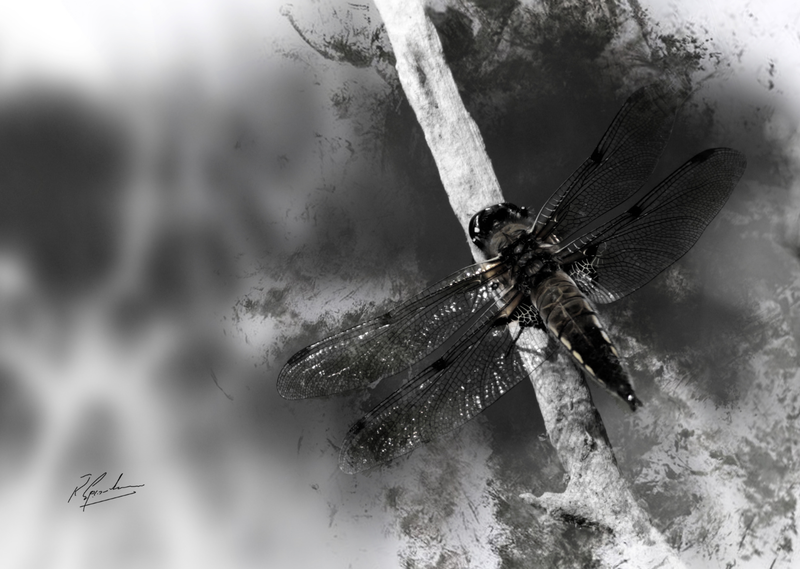 She walks away, but overhears a couple who are looking at another artefact in a glass case and musing whether or not it is a dragonfly. Claire moves immediately to the case, labelled as containing objects found on the battlefield. 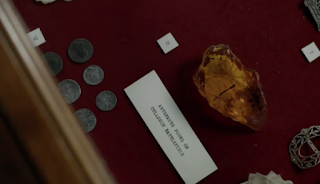 In the centre is the piece of amber that Hugh Monroe had originally presented to her as a wedding gift. At 8:18am in Culloden House, Dougal advances on Claire and Jamie, as the latter tries to explain to his uncle that it is not what he thinks. But Dougal is past the point of reason. His emotions escalating rapidly, he says that Jamie has betrayed them all, not only his people but Scotland as well. There is no doubt who he blames, turning to Claire and letting fly a string of insults. 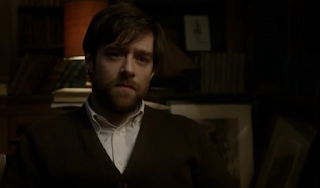 Jamie instantly defends Claire, saying that Dougal mustn’t speak that way even in his anger. But Dougal says they are past anger, draws his sword and lunges at Jamie. The fight is brief and vicious, Jamie trying to shield Claire, defend himself and fight off Dougal, while all the while trying to make his uncle see reason. 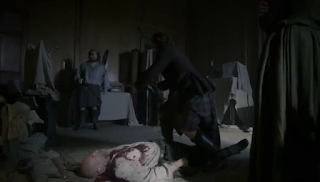 As Dougal aims a knife at Jamie and prepares to strike, Claire breaks a box over his head, which puts Dougal onto his back. Still his knife is aimed at Jamie’s heart and it takes all the younger man’s strength to turn it around. Claire rushes to Jamie’s side and leans her weight onto his shoulder. The result is immediate, gruesome and heartbreaking. 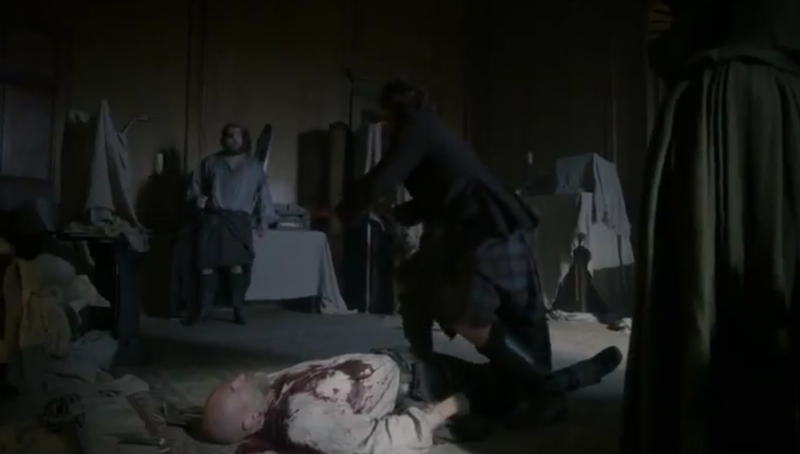 The knife sinks into Dougal’s chest and the desperation from the fight is replaced with shock and remorse, as Jamie begs forgiveness in Gaelic from his uncle’s lifeless body. This is a stunning scene, with tour de force performances from both Sam Heughan and Graham McTavish, whose look of shock at the point of death is exquisite. The method of Dougal’s death is a departure from the books, as in Diana Gabaldon’s original, it is Jamie alone who kills his uncle. By having Claire assist Jamie, it underscores the fact that the Frasers are united in everything now and that there is truly nothing they won’t do - both to save each other and in their desperation to stop the battle. 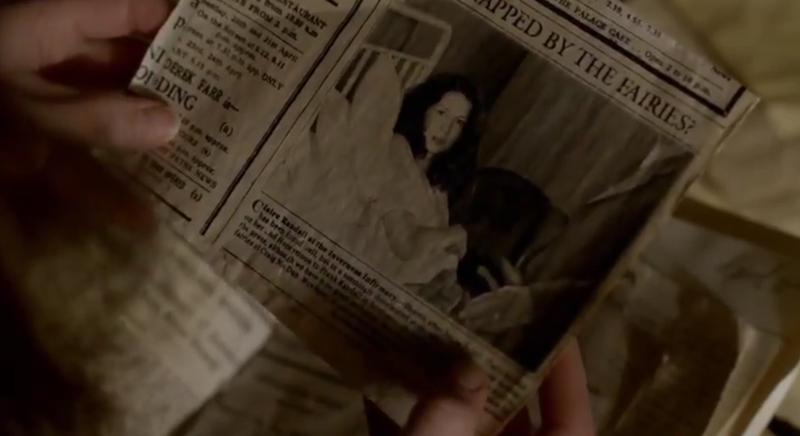 There is now, however, an alteration from Claire’s claim in an earlier episode that bad things tend to happen when they are apart. Now bad things are also happening when they are together. There is no doubt that this act will have catastrophic consequences, but viewers must wait to see what these are, as we are once again returned to 1968. In the dusty storeroom, Roger and Brianna find the Reverend’s journals, along with an unwanted furry visitor. Roger performs an improvised rat satire to chase it away, explaining to Brianna that it is an old Scottish custom, designed to convince the rat that there is better eating to be had elsewhere. Amused, Brianna remarks that there shouldn’t be a rat to be seen for miles, but Roger has been distracted by the discovery of the toy plane that he had played with as a boy. 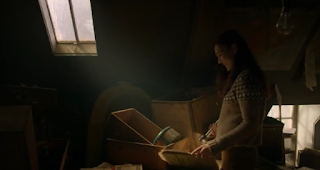 Brianna too, is soon distracted - by a box marked Randall. Opening it, the pair discover photographs of Frank and Claire, a letter of commission for Black Jack Randall signed by George II and a letter from Frank to the Reverend Wakefield, asking the Reverend to abandon research into Black Jack, as he was “not the man I thought.” Confused, Roger and Brianna decide to take the box into the library, as the centuries flip again. 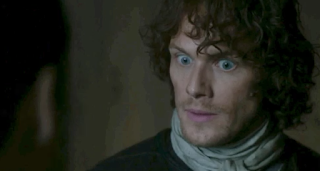 It is 8:26am when Rupert discovers Jamie and Claire by Dougal’s body. Horrified, he says that he wishes he could have torn out his one good eye to stop him from seeing the carnage before him. Jamie begs Rupert for two hours in which to take care of some things, promising that he will then return to answer for his crime. Reluctantly, Rupert agrees, saying that he will grant the two hours only because of their friendship that now lies murdered along with Dougal and that when Jamie returns, he will damn Jamie’s soul to the fiery pit. The scene ends with Claire and Jamie staring tearfully at one another. The Culloden battlefield in 1968 is a desolate place. Claire wanders around the clan headstones, Frank’s voiceover recounting the battle and what had happened to the highlanders on the fateful day. 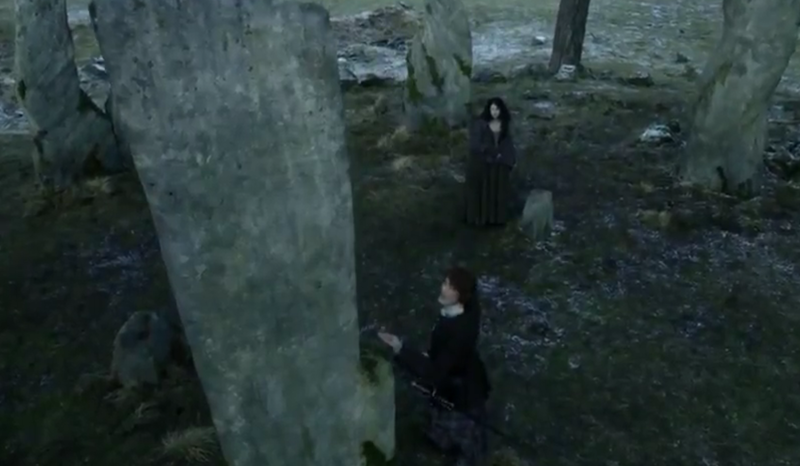 Stopping in front of the one bearing the name Clan Fraser, Claire meets a woman placing some flowers by its base. “Are you a Fraser?” she asks. “Yes,” Claire replies. “I am.” With a small smile, the woman moves away, leaving Claire alone. 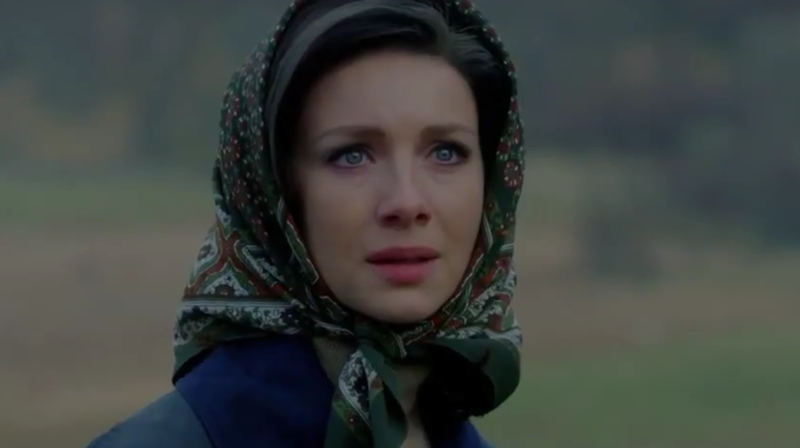 At this point, it has to be said (again) what an amazing actress Caitriona Balfe is. Another review referred to her ability to emote so beautifully when her scene partner was, in fact, a rock. But this is precisely what she does. 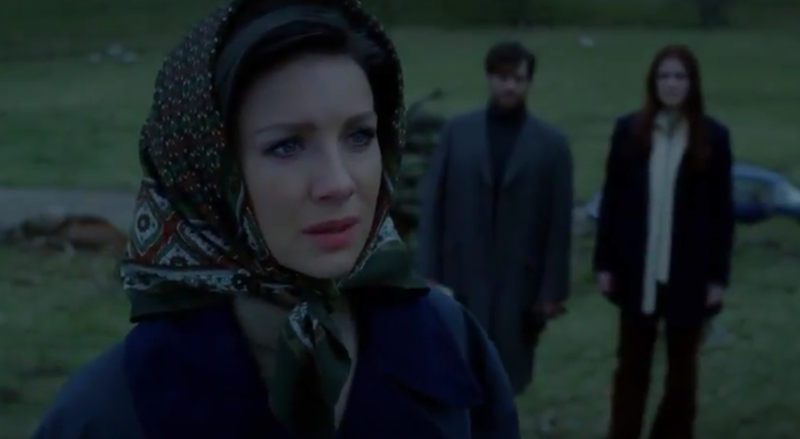 Conjuring up the image of Jamie in viewers’ minds as clearly as if he were there in the shot with her, Caitriona Balfe’s Claire speaks directly to the spirit of her husband. Resting her hand on the headstone, she says that she is not going to cry and that she has come with good news. 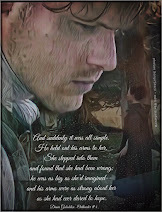 Lovingly, she tells Jamie about Brianna, named for his father, as she had promised. Claire confesses that she had been angry at Jamie for some time, for forcing her to go and live a life that she did not want, but concedes that he was right: Brianna was safe, loved and raised well. She tells Jamie of the traits that Brianna shares with him and how sometimes it takes her breath away. Sitting by the gravestone, Claire begins with the details of Brianna’s birth and soft music begins. The camera pans back and we understand that Claire has been talking for quite some time, but when she is done, she congratulates herself on not crying, joking with Jamie that she bets he didn’t think she could do that. Despite this though, her eyes do begin to tear up as she speaks of their final day at Craigh Na Dun. She tells Jamie that there was one thing she hadn’t said at the time and that now, finally, 20 years later, it is time to do so. With a small sigh, she whispers “Goodbye, Jamie Fraser. 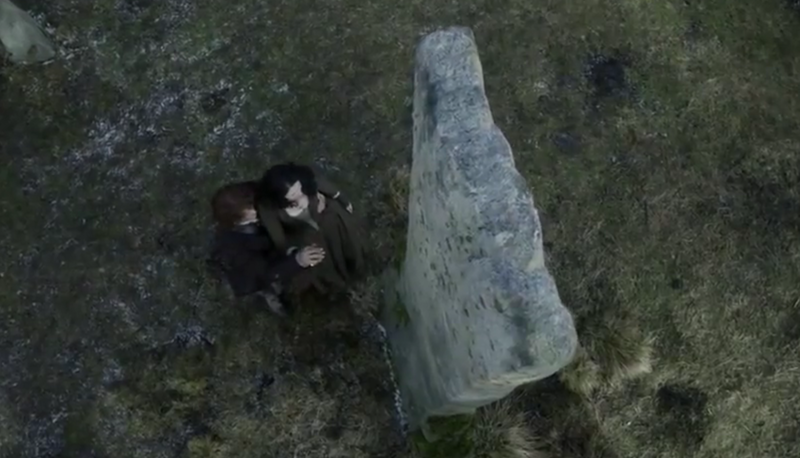 My love.” The Jamie and Claire theme swells behind her as she lays a hand tenderly on the top of the stone and adds, “Rest easy, soldier.” It is so simple, yet so honest and beautiful, that it is difficult to imagine that viewers aren’t at least a little misty eyed as Claire walks away. A confrontation with Claire soon follows. 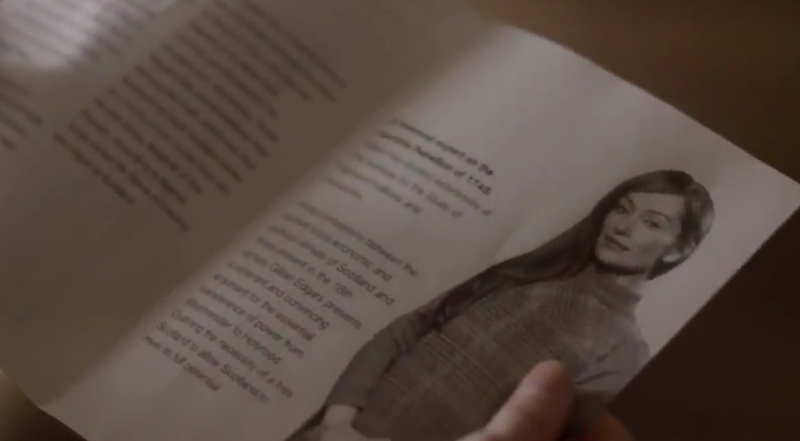 Brianna has pieced together enough bits of information together to know that Frank was not her father. She demands to know where Claire has been for the past 2 days, asking whether she has, in fact, been with the man who is. Claire is thrown by the directness of her daughter’s questions, all the more so because she has just made her own peace with Jamie’s spirit and has decided to move on. She tells Brianna that it is complicated, a choice of words that inflames the younger woman’s temper further. Brianna tells her mother that no, it is quite simple. She has done the maths and Claire was three months pregnant when she returned from “the fairies”. 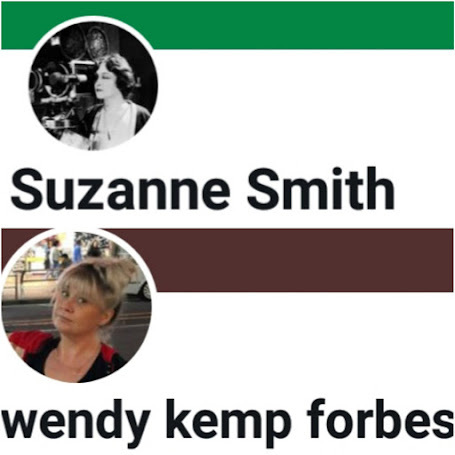 The two woman are looking at each other when Roger inadvertently walks into the middle of the argument, armed with a new piece of correspondence. Sensing what he has landed in the middle of, Roger tries to leave. But Brianna is insistent. Roger hasn’t lied to anyone, she says. It is his house and he is her friend. Reluctantly, Claire agrees and just as reluctantly, Roger sits next to Bree on the couch. Taking a deep breath, Claire begins her story. There was another man, she says, one whom she loved very much. 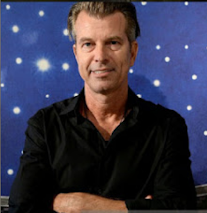 It was this man that was Brianna’s real father. 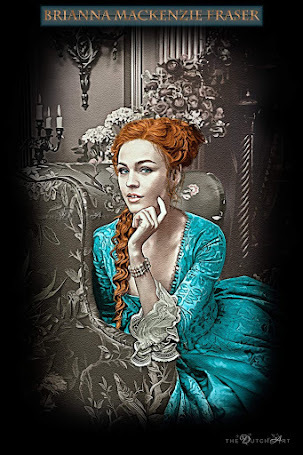 Brianna accuses her mother of lying to her for her whole life, becoming angrier when Claire tries to explain that Frank hadn’t wanted her to know, but wanted to raise her as his own, in America, where they could put the past behind them. Brianna is then suspicious of their presence in Scotland, demanding to know whether Claire had planned some surprise introduction whereby she would be introduced to her real father. 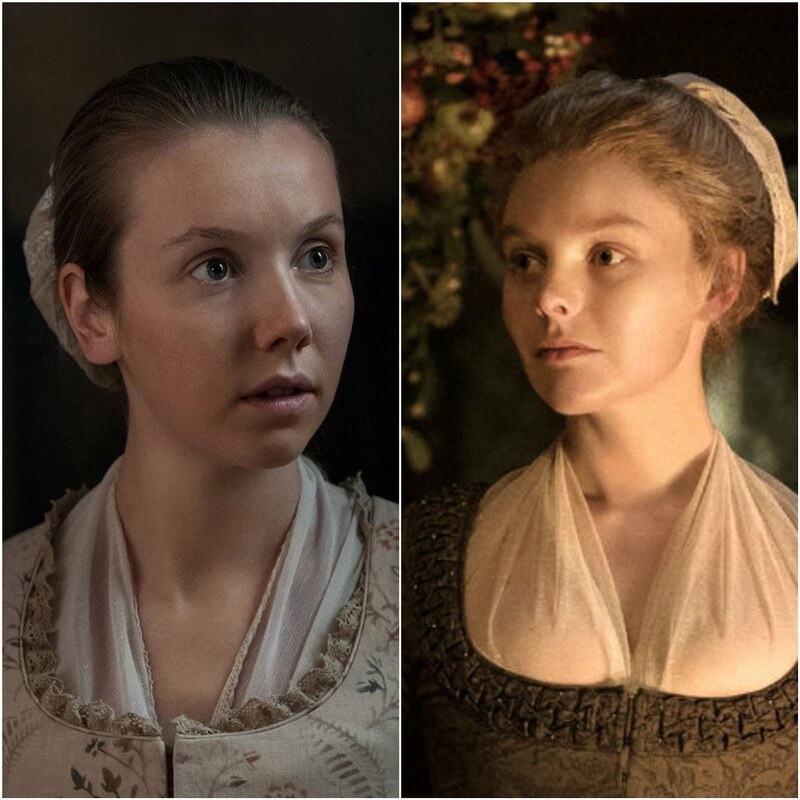 When Claire says no, that isn’t possible, Brianna concludes it is because the man has no interest in meeting his daughter, but Claire corrects her, explaining that he is dead. Frank hadn’t wanted Brianna to know about him, Claire repeats, so for 20 years she hasn’t uttered his name out loud. The tears well in both women’s eyes - anger from Bree and relief from Claire, who is now anxious to tell her daughter all about Jamie Fraser. But Brianna will not let Claire do this, telling her mother that she doesn’t want to know a single thing. She stands to leave, but Roger stops her. Using first “Bree” and then correcting himself to say Brianna, Roger touches her hand gently. “You told me you wanted to know the truth no matter what,” he reminds her. “This is it.” He strokes her hand briefly with his thumb before releasing it and the gesture is all the more intimate for its simplicity. Reluctantly, she rejoins him on the couch and Claire continues. 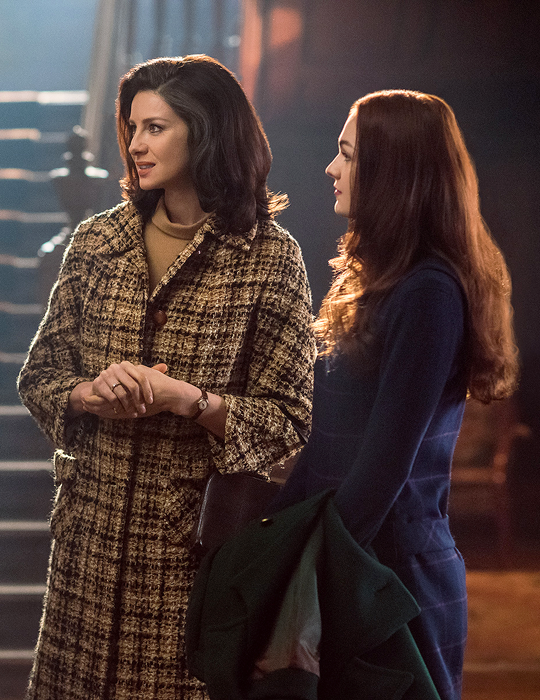 Claire tells Brianna that Jamie had loved her very much, even though he had not met her. Tears falling freely, she says that Jamie would have raised her, were it not for the Battle of Culloden. She hesitates to say the words, knowing how they must sound. Viewers must wait for the reaction though, as we are taken to the aftermath of Dougal’s death, at 8:34am. With Claire beside him and Fergus looking on, Jamie confesses to Murtagh that he has killed his uncle. With typical Murtagh brilliance (and who doesn’t wish for a Murtagh in their life?) Jamie’s godfather says only, “I can’t say I’m surprised, only that it took you so long” before switching to the practical and asking what needs to be done. In response, Jamie unrolls a document. It is a deed of sasine, transferring the ownership of Lallybroch to Jenny’s eldest son, thereby keeping the estate in the family. To further ensure this, the document is dated from the previous year, before the rebellion and before Jamie’s branding as a traitor. 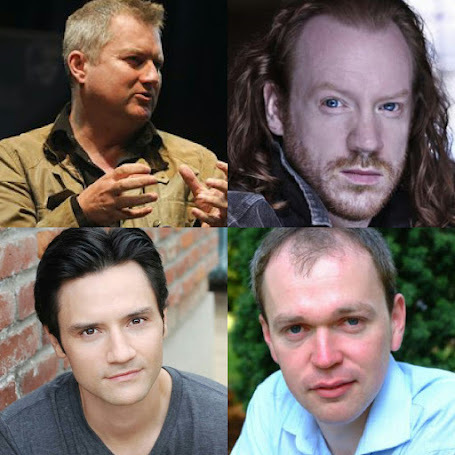 The document needs two witnesses and Murtagh sends Fergus in search of ink and a quill. 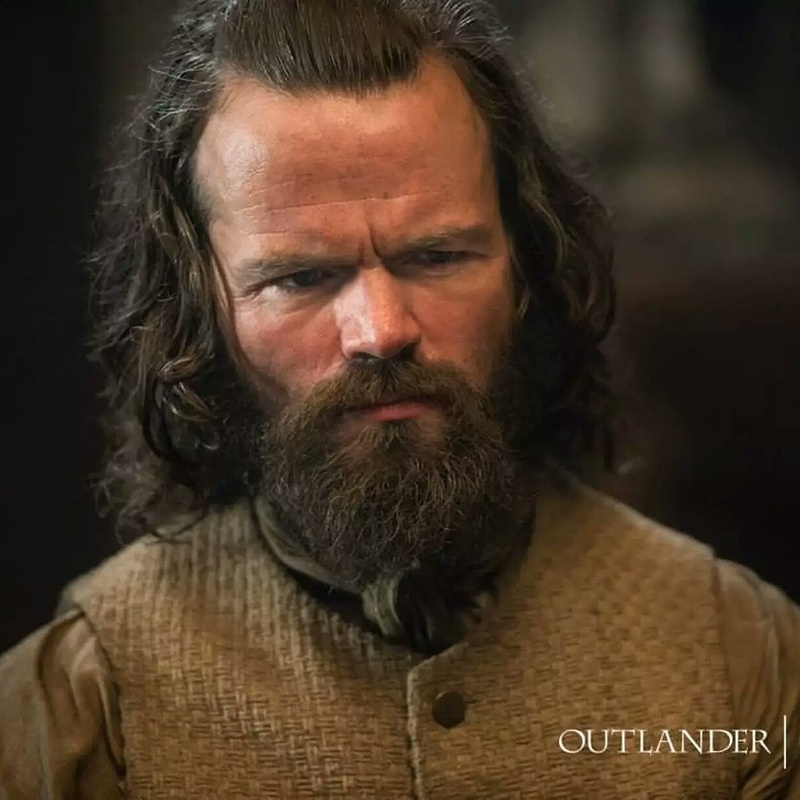 Murtagh asks if Jamie wants him to deliver the document to Jenny, but Jamie plans to send Fergus, informing the boy that he must ride to Lallybroch at once. From the look on her face, it is obvious that Brianna is finding this story hard to swallow. Roger too, looks bemused. Sarcastically, Brianna asks her mother how long she has been cooking up the story. Claire admits that it sounds crazy, but Brianna is incredulous. Did Claire really think she would believe such a fairy tale? She is not 5, she reminds Claire. 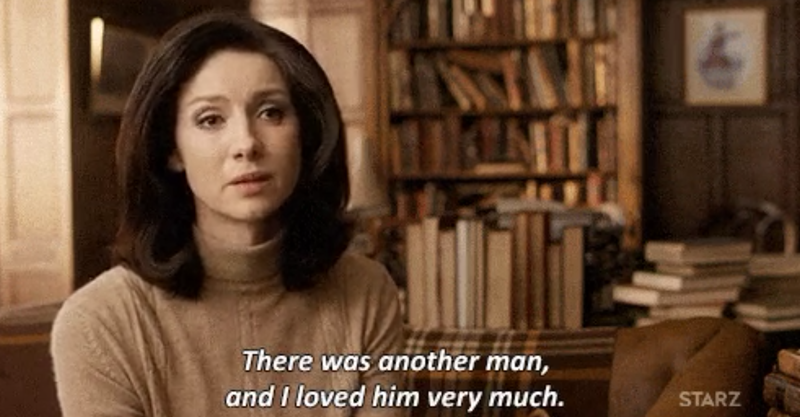 How is she meant to believe that the man who has loved her for 20 years is not her father and that her real father is in fact a tall, red headed, kilt wearing man from the 18th century? Undeterred, Claire tries again. She agrees with Bree that Frank was her father in every way that matters, except for one. He didn’t make her. Claire reaches out to touch her, but Brianna pulls away. 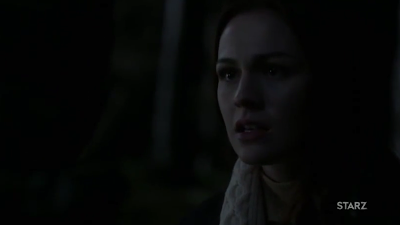 Her voice breaking, Claire tells Brianna that she is just like Jamie, repeating again that Jamie would have loved and raised her, if not for the battle. Angrily, Brianna finishes the sentence with her, telling her mother to stop. Desperate to make her daughter believe, Claire takes out the copy of the deed to Lallybroch that the woman from the genealogical office had copied for her earlier and shows Brianna her signature. But Brianna is furious. She tells her mother to admit that she is not a perfect person and to own up to the fact that she f*cked someone else whilst being married to Frank, just like many other bored housewives. This makes Claire equally furious. She uses the same language to defend herself, which shocks Brianna. Claire was not bored, she yells, and what she had with Jamie was far more than f*cking, with Jamie having been the love of her life. Brianna asks Claire why she is doing this and Claire replies that it is the truth. But Brianna won’t believe. Only two people know the truth, she says, and one of them is dead. As she stalks from the room, she utters the sentence designed to hurt: “Too bad it wasn’t you.” With these words, she achieves her aim. Claire’s eyes widen in despair. 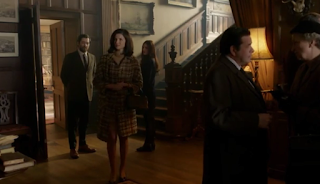 Roger, an unwilling witness to the whole exchange, gives her a look of pity before following Brianna. 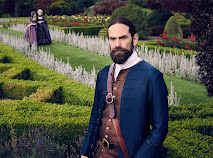 At 8:37am, Murtagh and Claire are adding their signatures to the deed of sasine, as Jamie gives urgent instructions to Fergus. He is to stop for nothing except sleep and to hide himself well when he does. 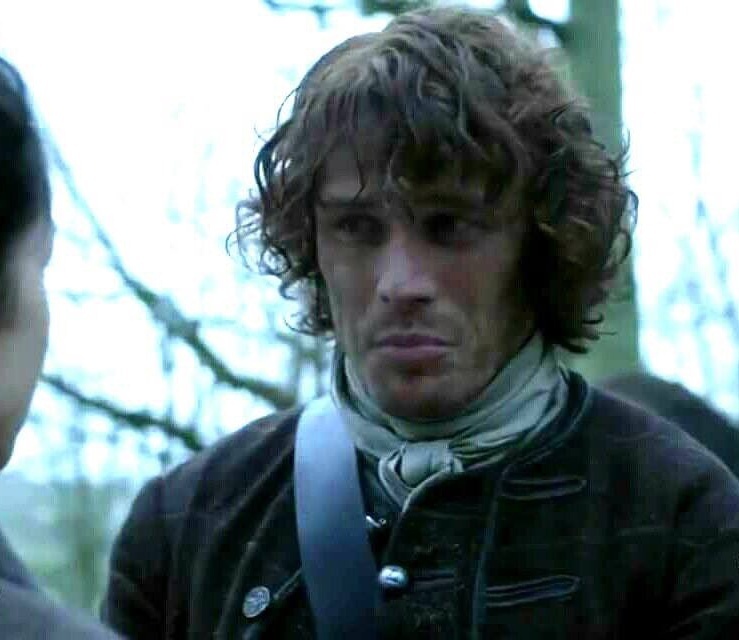 Giving Fergus a knife, Jamie tells Fergus that he is a soldier now, one that he loves like his own son. A single tear smudges Claire’s signature as she goes to Jamie and Fergus to make her own farewell. 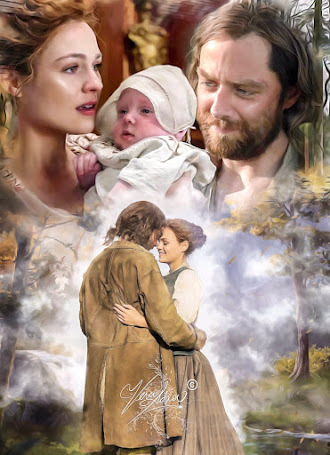 “Like our own son,” she echoes, tearfully pulling Fergus into her arms and kissing him. Murtagh too farewells the boy, bowing solemnly to Fergus as he opens the door and heads in search of a horse. 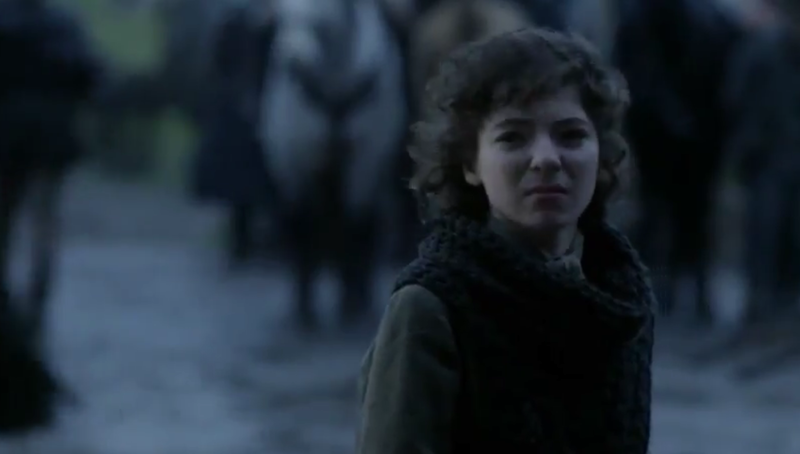 We see the despair on everyone’s faces as Fergus looks back one last time. In the pub, Brianna and Roger are discussing Claire’s story. Roger has found some extra documents from the Reverend’s collection that had obviously been important to his late Father’s research. Hesitantly, he mentions the deed of sasine, commenting that it did seem authentic. He adds that Brianna had always said that her mother lived in another world and that perhaps Claire is now trying to show her that world. What’s important, says Roger, is not whether he or Brianna believe Claire’s story, but that Claire herself believes it. What they need to do is to keep an open mind. Jokingly, Brianna responds that she would rather keep an open tab, sending Roger back to the bar for another drink. Meanwhile Claire has been looking back through the press clippings of her reappearance, when her eyes fall on the pamphlet that Brianna had been given on campus. The pamphlet is complete with presenter’s photograph and Claire looks down at the face of Geillis Duncan. Claire remembers the date that Geillis had told her at their witch trial, the date of Geillis’ own travel through the stones : 1968. While the ghosts have been all around Claire, this one is no ghost. Geillis is nearby and Claire sets out to find her. 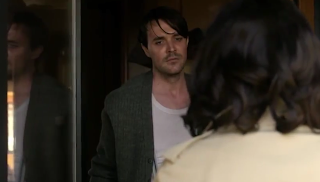 The next scene sees Claire ringing the door bell of a house, which is answered by a dishevelled looking man. The house belongs to Gillian Edgars and the man is Greg, Gillian’s husband. He invites Claire inside and pours them both a drink. Claire tells Greg that she will not be in the area long and would like to say hello to her old friend, if he will tell her where she is. 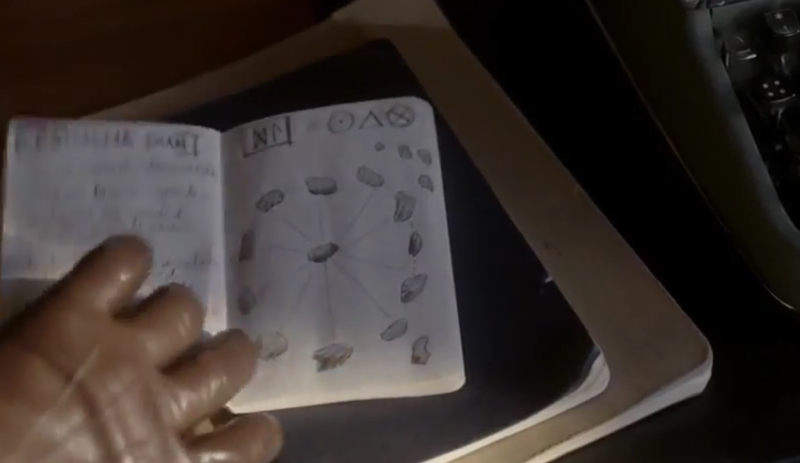 Greg replies that Gillian is probably with the Roses, or as he calls them, the bloody nationalists, adding that she spends all her time at the institute, using his money to pay for courses and filling notebook after notebook with her findings. Finally, he admits to Claire that following an argument where he told Gillian that she should get a job and learn to type, she had left him and he hasn’t seen her for weeks. He drains his glass, hugging the bottle close and closes his eyes. He is a pathetic figure, asking Claire if she will tell “Gilly” to come home should she run into her and to tell her that he loves her. Claire agrees and with Greg now passed out in the chair, she takes Gillian’s notebooks and lets herself out. 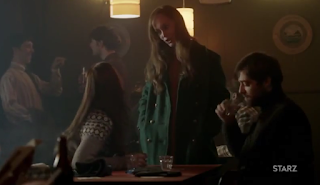 But it is not Claire who next runs into Gillian, but Brianna, when Gillian comes into the pub following the rally. Brianna apologises for missing it, adding that she and Roger had been having a whisky. (As an aside, in the books, Brianna abhors whisky.) Roger says that it has been a tricky day, to which Brianna says that her mother is insane. Gillian smiles, saying that this is a sentiment echoed by daughters everywhere. Brianna talks of attending the next rally, but Gillian replies that she is leaving that evening, in order to further the cause and book readers and tv viewers alike now know what form that leaving will take. As a final piece of advice, Gillian encourages Brianna to keep asking the hard questions, as that is the way the world changes. 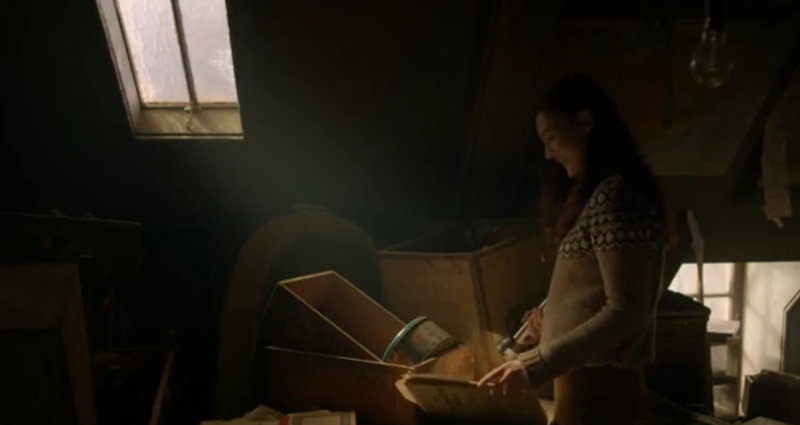 By the fire, Claire is reading the notebooks, filled with Geillis/Gillian’s theories on time travel. It is obvious that thought and preparation has gone into them, and Claire is shocked to read that her one time friend believed that a human sacrifice was necessary for travelling through the stones, as well as gemstones for protection and guidance. Realising that Geillis will soon be making her way to Craigh na Dun for her 1968 journey, Claire wants to warn her, to hopefully prevent her friend from the destiny that awaits her in the 18th century, where she will burned as a witch. 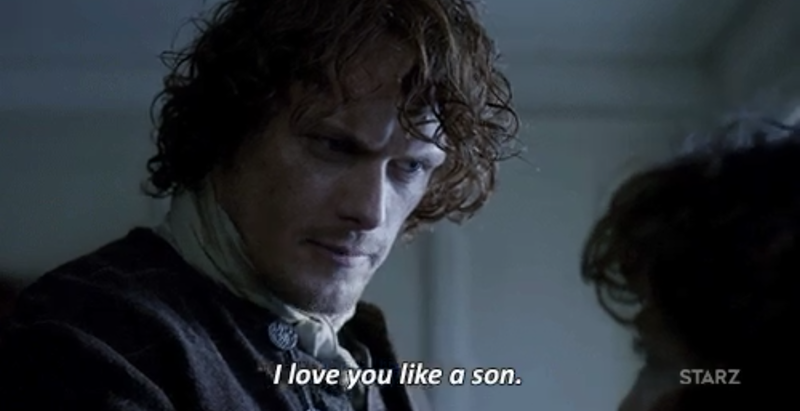 At 8:43am, Jamie gives Murtagh his last orders. 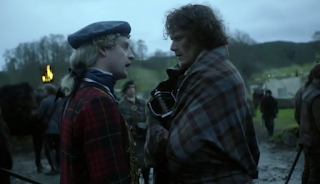 He tells his godfather to gather the Frasers of Lallybroch together and to get them away from the battle. Everything will be chaotic, he reasons, and no one will try and stop them. Jamie wants the men to be sent home. No matter how righteous, he says, the battle has been doomed from the start. They have done all they could, but it is over and, like Colum had predicted, Jamie will not have his kin die for nothing. 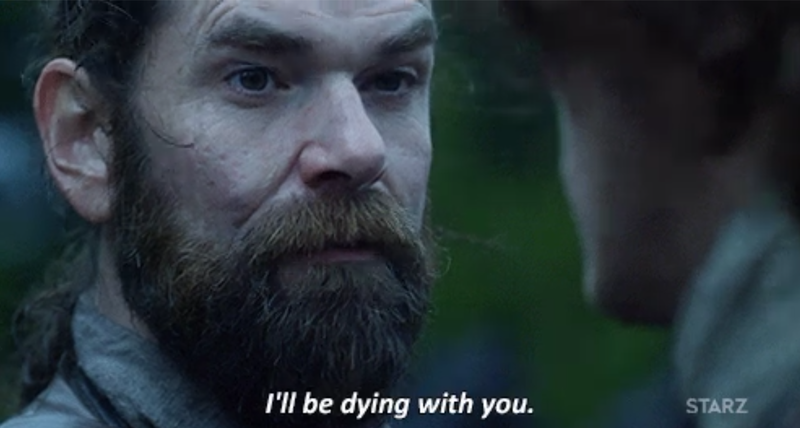 Murtagh asks what Jamie will do. Jamie replies that he will take Claire to safety and then turn back to Culloden to fight until it is done. Nodding, Murtagh promises to guide the Lallybroch men to safety and set them on the road home, but will then return to fight by Jamie’s side. Jamie tries to prevent him, repeating that he doesn’t want Murtagh dying for nothing. But Murtagh only smiles at his godson. “I won’t be,” he says. 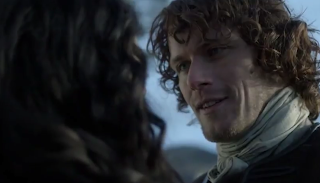 “I’ll be dying with you.” Jamie can do nothing but nod in agreement. This is a beautiful moment between the two men, underscoring the loving bond they have always shared. 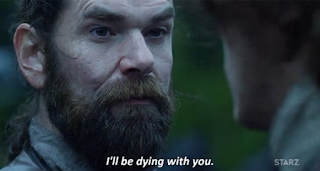 Murtagh is every bit as heroic as Jamie, all the way along thinking of nothing but his godson’s wellbeing. Even when all is lost, Murtagh will not have Jamie die alone and viewers are as moved as Jamie by this ultimate sacrifice. Claire is preparing for bed when Brianna comes into the room. 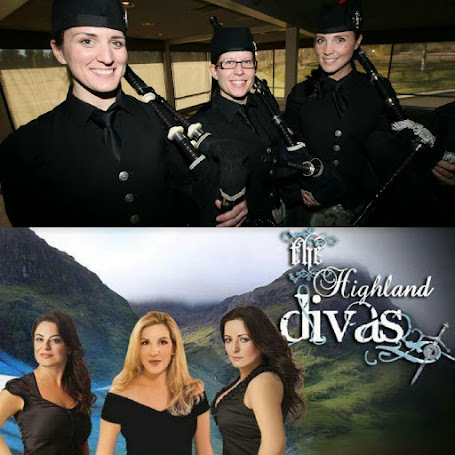 Laying down an olive branch of sorts, Brianna says she doesn’t want to argue. 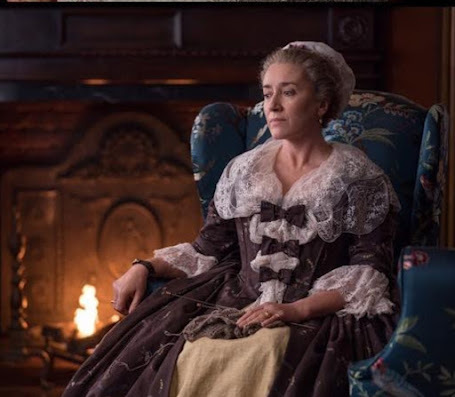 She suggests that they agree that she has a father who isn’t Frank and that while she doesn’t want to discuss Claire’s “time travel delusion”, she does want to know more about Jamie. Smiling, Claire agrees. Jamie was tall, she begins, with red hair just like Brianna’s. His father’s name was Brian, which is where Brianna’s name came from. Jamie spoke French, played chess and had a sister, called Jenny. Taking Brianna’s hand, Claire says that it would take too long to tell her everything, but that she will. She begins to tell Brianna of the afternoon she has spent by Jamie’s grave at Culloden, but Brianna stands immediately, saying that this is where Claire loses her. But Claire grabs her hand. “I didn’t intend to fall in love,” she says. “In fact, I fought against it. But I couldn’t deny what I felt for him. I tried, but I couldn’t. It was the most powerful thing I had ever felt in my life.” Brianna says nothing, but we see her disbelief waver a little. 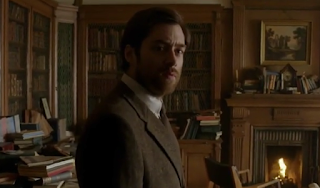 Roger is in the study when Claire appears a while later. He asks after Brianna and upon hearing that the two women are talking, comments that this is an improvement on shouting. Holding the White Roses of Scotland pamphlet, Claire asks if Roger knows Gillian Edgars. Roger replies that he doesn’t really know her, other than when Brianna had taken the pamphlet from her. 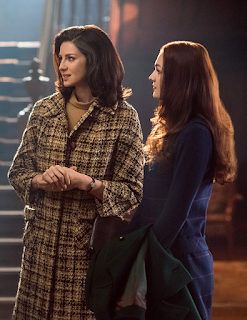 This shocks Claire, asking if Brianna had in fact met her. At this point, Brianna enters the room, proclaiming her admiration for Gillian, even if she is a bit crazy on the whole “Scottish nationalist thing”. Claire asks if Brianna knows where Gillian is, as she needs to find her. Roger mentions the pub conversation, saying that Gillian had mentioned going away to further the cause and he doesn’t believe that she would be back. Claire mutters that Gillian must be going through the stones and Brianna starts to lose patience. 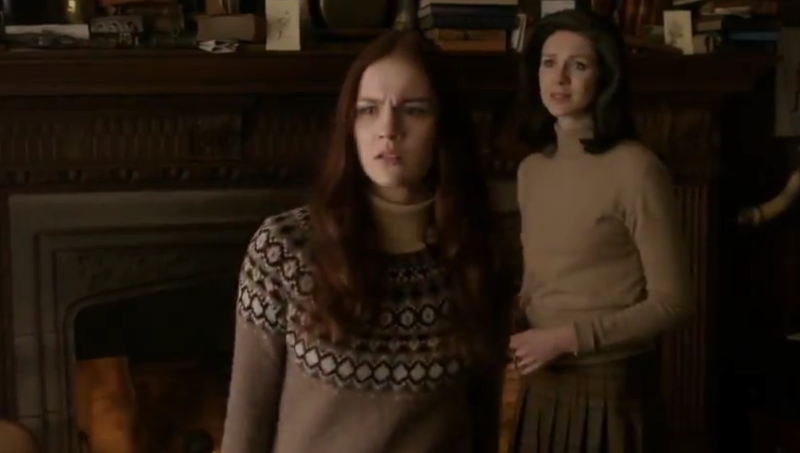 Brianna admonishes Claire for trying to drag Roger into the story, but Claire retorts that Roger has the same right as Brianna to know who he is. Roger responds that if this is all true then Gillian has to be stopped, particularly if she is going back to be burned alive. But Claire is worried about the implications of stopping Gillian. What if it means that Roger will never be born? Roger reasons with her: how can he not be born if he’s already there? He can’t simply evaporate. But Claire is still hesitant, saying that she doesn’t know how it all works. Brianna asks Roger if he is actually buying the story. Not taking his eyes off Claire, Roger answers that he doesn’t know, but at the very least they should find Gillian and warn her. Claire agrees, saying that at least that way she can warn Gillian not to draw attention to herself in the past. Exasperated, Brianna says that Roger is feeding Claire’s delusions and stalks from the room, as Claire calls after her. In the hallway, Roger agrees that perhaps he is feeding Claire’s delusion, but that this is their opportunity to make Claire face facts. Brianna asks him what will happen if Gillian is just as crazy. Roger replies that perhaps it means that they will watch as a woman slams her head into a 5 tonne block of granite, but either way, it will give them a chance to put a stop to it all. Brianna can’t fault this logic and agrees. At 8:54am, Jamie is leading Claire in the opposite direction to the marching men. Finally she asks where they are going. He responds that while Red Jamie will not get far, he can save her and he will. They can leave together, she says, sail away somewhere. But Jamie tells her that the ports are closed and he will take a bullet or a blade over hanging or the wrath of the MacKenzies. If he is a dead man already, then he will choose the battlefield. Claire starts to panic, saying that she will stay with him. She asks if, at the witch trial, he would have left her if she had gone to the stake with Geillis? He responds that he would have gone to the stake with her and to hell and beyond if necessary, but the difference is that he was not carrying her child. This brings Claire up short. It’s too soon to know for sure, she says, but Jamie is insistent. She has never been late in her courses, he tells her, and she hasn’t bled in two months. Claire can’t believe that he had kept count in the middle of a war, but confirms that he is right, although she hasn’t known herself for long. They stand for a moment, hands over her belly, his shaking as he says that the child will be all that is left of him and that they must go. Her distress builds and she repeats that she can’t leave him. He reminds her of his word to Rupert and of her own to him: that if it came to it, she would go back through the stones, back home. “But you are my home,” says Claire, her eyes full of tears. “And you are mine,” he responds, “but this home is lost and you and the bairn must go to a safe place, to a man who can care for you both.” She knows he is right, but it is tearing her apart. “There is no time,” he says, holding out his hand for her to mount the horse behind him. Petrol is being poured over a body as night falls on Craig Na Dun. Roger, Claire and Brianna arrive, Claire recognising Greg Edgar’s car. The body is set alight as Claire leads the way towards the stones and the others follow. 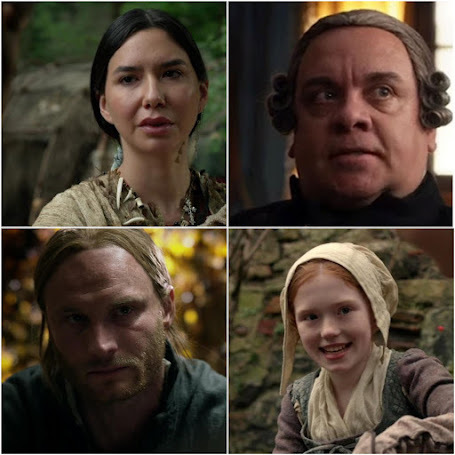 Brianna asks what the smell is and Roger, in a brilliant echo of his witch ancestor’s line from the season 1 witch trial, comments that it smells like “a f*cking bbq.” But they are too late. Claire screams out Geillis’ name, but all they can do is watch as, far from smashing her head into the rock, Gillian Edgars passes straight through the stone and disappears. Roger and Brianna cannot believe what they have witnessed, nor what they can hear. Both of them comment on a loud buzzing noise, that is getting louder. This is a vital point for future events in future seasons. It is not lost on book viewers, and hopefully not on tv only ones either. 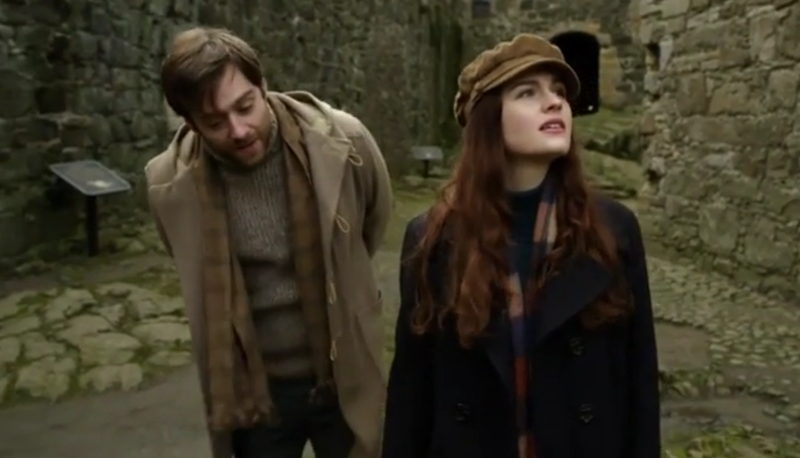 Claire sends Roger to go and get help, while Brianna and Claire stare first at the stones and then at each other. Jamie leads a reluctant Claire into the circle of stones. She asks how she will explain everything. With a gentle smile, Jamie tells her that he will leave that to her, to tell Frank what she wants about him; about them both. If Frank wants to hear, Jamie says, as he takes Claire’s hand, he asks her to tell Frank that he is grateful, that he trusts him and that he hates him to the very marrow of his bones. He pulls Claire towards the centre stone, but she baulks. The buzzing is so loud, she tells him and she is not ready. Pleading, she begs him to go with her, to try and go through the stones, imploring him to hear the buzzing that she does. But he can hear nothing and besides, he says, touching the stones to no effect, it isn’t his place. His destiny is on Culloden Moor. But Jamie promises to find her. “If I have to endure 200 years of purgatory, 200 years without you,then that is my punishment that I have earned for my crimes.” He reaches out a hand to stroke her face as he continues. “For I have lied, killed, stolen, betrayed and broken trust.” His hand hovers over her belly, in an unspoken acknowledgement of Faith. Her face is a picture of misery, as he draws her closer. “But when I stand before God, I’ll have one thing to weigh against all the rest.” He kisses her. “Lord, you gave me a rare woman.” He kisses her again and she clings to him desperately. “And God I loved her well.” Overcome with sorrow, with love and with need, the two sink to the ground in their final passionate goodbye. This is the speech and scene that book readers have been waiting for, and Sam Heughan and Caitriona Balfe smash it out of the park. It is hard to imagine it being done any better; the despair of the two characters being felt by every viewer watching. Gunfire is heard as they sit up. The battle of Culloden, the battle that they have given everything to try and prevent, has begun. From her pocket, Claire takes the piece of amber that Hugh had presented to her as a wedding gift, wraps it into her scarf and gives it to him. “Keep it with you,” she says. “Blood of my blood.” “And bone of my bone,” he adds. “As long as we both shall live,” she whispers and they kiss. Pulling Claire to her feet, he places a ring onto her finger. “This belonged to my father,” he says. “Give it to the bairn when he’s old enough.” Claire agrees, adding that she will name the child Brian, in honour of Jamie’s father. The time has come. Eyes locked, arms around each other, Jamie almost waltzes Claire backwards until she is in front of the centre stone. “I love you,” she whispers, tears falling freely. “I love you.” “And I you,” he replies. With one final kiss, he turns her around and links his fingers through hers. Only then, when she cannot see his expression, do we see the full anguish on his face, as a tear slides down his cheek. He whispers brokenly, “Goodbye, Claire” and bows his head, their hands reaching forward together to touch the stone. In the books, there is a line where Claire says that she can actually hear her heart break. This is the moment where the hearts of viewers everywhere break and it is virtually impossible to remember that these are two actors recreating a piece of fiction. It is painful, beautiful and utterly, desperately sad and we fully understand Claire’s anguished cry at the stones at the beginning of episode 1, which would have come only moments after these events. “I believe you. I don’t understand it, but I believe you.” She then asks Claire for nothing but truth between them from now on, unaware that she is speaking almost the exact words that her father had spoken. But this similarity is not lost on Claire, who strokes Brianna’s face and tells her that she is so like her father, before readily agreeing to Brianna’s request. At last, the two women embrace. The first hint of dawn is breaking as Roger returns. He has anonymously called the police, but is unsure how long it will be before they arrive. 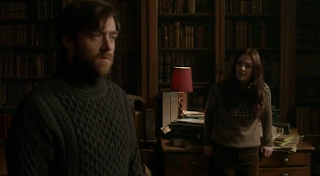 Brianna asks Roger to tell Claire what he had discovered. Pulling the papers from his pocket, Roger tells Claire that it was some research the Reverend had done at Frank’s request and that he is uncertain if the Reverend had ever sent it. Claire asks what the research says and Roger explains that after the battle of Culloden, a few seriously wounded Jacobite officers had taken refuge in an old house for two days before being taken out to be shot. 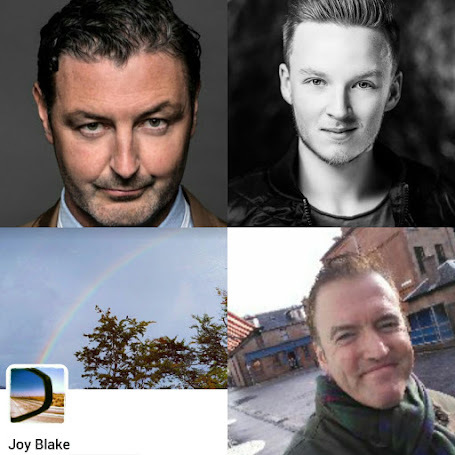 All,that is, apart from one Fraser of the Lovat regiment, who had escaped execution. Claire is guarded, saying that there were a lot of Frasers on the field that day. Roger agrees, but adds that there were only five Fraser officers, four of whom are mentioned on the memorial plaque at the Beauly church. Hardly daring to hope, Claire asks who the 5th officer was. “He survived,” Claire says, as the music builds. “He survived!” She turns back towards the stones as the sun begins to rise above them. 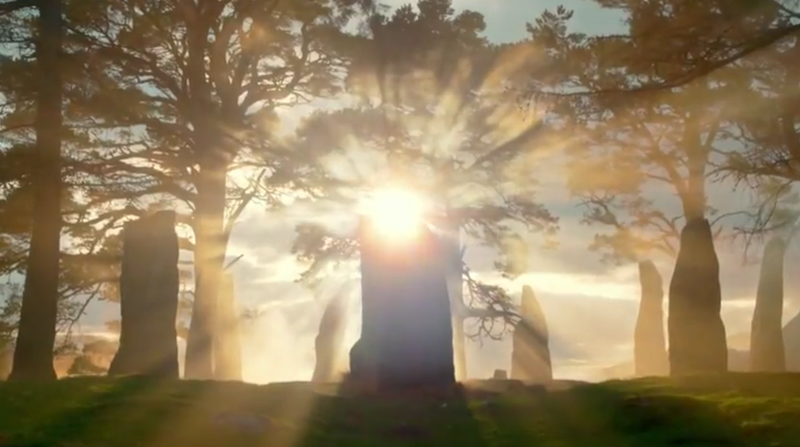 “If that’s true,” she says, with a look at Bree, “then I have to go back.” The sunlight reflects in her eyes as the rays surround the centre stone. The music builds to its climax and the episode - and season - ends on a note of hope. This final episode answers the questions posed by the first and we are left full of emotion for all that has come in between. 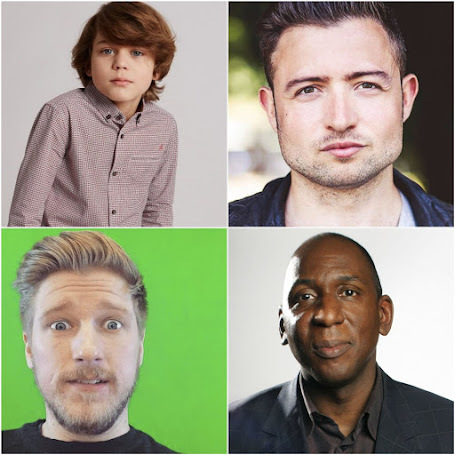 The themes of love against all odds; heroic actions; blind faith to the point of destruction; death, loss, forgiveness, friendship and finally hope that exists and endures - all these have been covered, each episode leaving us with something to think about, grieve over or rejoice in. Kudos to all. This recap was written by Susie Brown, a teacher-librarian and writer who lives in Australia. 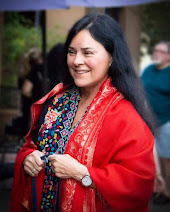 She has learned so much whilst writing about this series, which she wants to address in one last indulgent post - but for now, her heart is full of love and admiration for all who have brought Diana Gabaldon’s words to life.